Throughly grease the donut pan with coconut oil and pour batter into the molds 3/4 full. Bake for 15-20 minutes, until golden brown a cake tester comes out clean. Remove from pan and cool on wire baking rack. While donuts are cooling heat the coconut butter in a pan on medium-low heat. When melted, stir in maple syrup and whisk until a caramel colored, glossy sauce has formed. Carefully pour glaze over the donuts on the rack, allowing excess sauce to fall below. 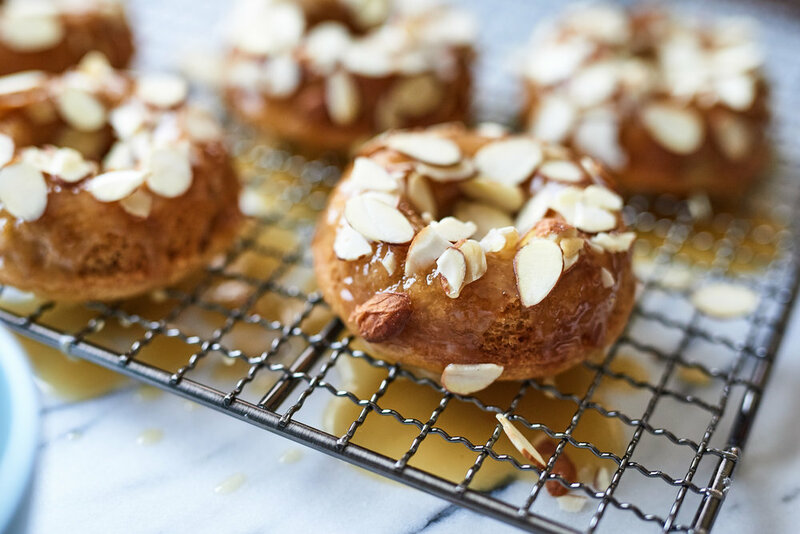 While the glaze is still warm scatter sliced almonds on the donuts.